Discover our award-winning hotel located at the base of Camelback Mountain in Paradise Valley at JW Marriott Scottsdale Camelback Inn Resort & Spa. Our luxury hotel prides itself on providing guests with attentive service, deluxe amenities, heated outdoor pools, garden terraces and desert trails in the Sonoran Desert. Take our complimentary shuttle to our 18-hole championship golf courses, or treat yourself to a refreshing massage in our tranquil day spa. Savor gourmet dining experiences in our on-site hotel restaurants and bars, or relax in privacy with our resort's large casitas and suites boasting sophisticated furnishings and outdoor living spaces. Our pueblo-style, pet-friendly accommodations feature charming kitchenettes and an array of deluxe amenities, with a select few featuring private pools. Those in town with business needs or wedding plans will appreciate our elegant, large-scale event venues. 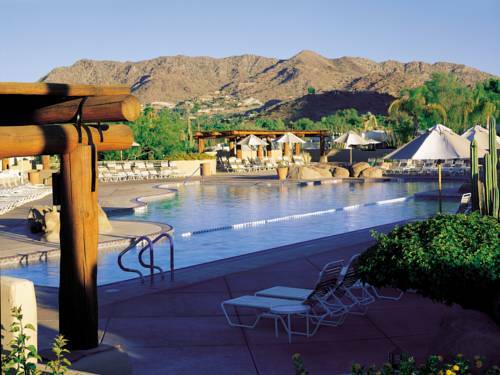 JW Marriott Scottsdale Camelback Inn Resort & Spa wants to make your stay in Arizona truly remarkable. Lincoln - A JW Steakhouse: Savor inspired American dishes at Lincoln, our JW Steakhouse restaurant in Paradise Valley with an intimate setting against Camelback Mountain and indoor/outdoor seating. Enjoy an inventive menu with delectable cuisine and Southwestern-infused cocktails. Bar 1936: Enjoy our Scottsdale resort's extensive drink menu of cocktails made from local spirits, whiskey flights and "toasting bubbles". With a name that pays homage to our rich history, Bar 1936 embraces its legendary past and idyllic Camelback surroundings. Rita's Kitchen: Indulge in the brilliant colors and flavors of regional cuisine based on America's rich Southwest heritage at Rita's Kitchen. Our warm and inviting Scottsdale restaurant is known for welcoming atmosphere, casual bar and delectable Sunday brunch. R Bar: With a beautiful outdoor lounge and cozy indoor seating, R Bar is a favorite hangout in Paradise Valley. Indulge in our signature margaritas during happy hour while enjoying live music and appetizing fare, including fresh guacamole, chips and salsa. Acacia at Camelback Golf Club: Energize yourself before a day of golfing with American breakfast classics and tasty lunch options at Acacia, our Camelback Golf Club restaurant with an Adobe-inspired exterior and patio that fits right in with its Arizona desert surroundings. Sprouts at the Spa: Unwind in lush landscapes and a serene atmosphere at Sprouts, our spa's wellness restaurant and juice bar. With a focus on fresh ingredients, our innovative, health-forward menu features fully-flavored, guilt-free smoothies and organic cocktails. Hoppin' Jacks at the Jackrabbit Pool: After a refreshing swim in our pools near Camelback Mountain, refuel with hearty favorites like quesadillas, pizza, club sandwiches and burgers at Hoppin' Jacks at the Jackrabbit Pool. Enjoy poolside dining with a cold beer, glass of wine or cocktail. Starbucks : Before a busy day in Scottsdale begins, head to our Starbucks coffee house for a specialty coffee drink, breakfast sandwich or sweet pastry to go. Or, pack a variety of light lunch options and refreshing beverages before hiking Camelback Mountain.